EMW3162 is the new module that design by MXCHIP. For embedded product applications, its focus is on the ultra-low power low cost. This Wi-Fi wireless LAN module combines the latest Wi-Fi technology and microcontroller technology within IEEE802.11b/g/n wireless communications and a variety of energy-saving mode, widely used in a variety of new intelligent electronic products. It has the latest features EMW316x series modules, but also keeps full compatibility with the EMW3280 module. 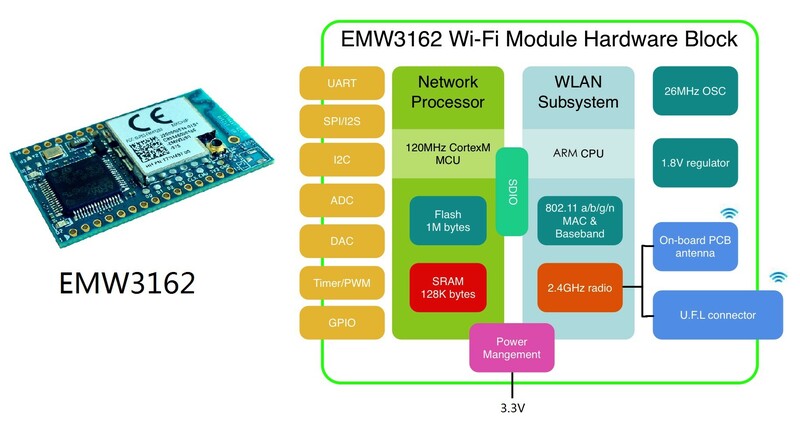 The EMW3162 has a built-in frequency of up to 120MHz to run the Cortex-M3 microcontroller STM32F205RG, 1M byte of Flash, 128k bytes of SRAM and extensive peripheral functions with the MxchipWnet embedded Wi-Fi firmware. Users can easily and quickly add Wi-Fi network communication capabilities for embedded devices. You can use the MxchipWNet software library for a variety of embedded Wi-Fi module applications. We also have another product, EMW3162 WiFi Module (External IPEX antenna), please click here to check it out. Click the button below to add the EMW3162 WiFi Module to your wish list.